Since 1986 Tailwinds has been your expert source of scale model aircraft. Call 800-Tailwinds with any inquiries. 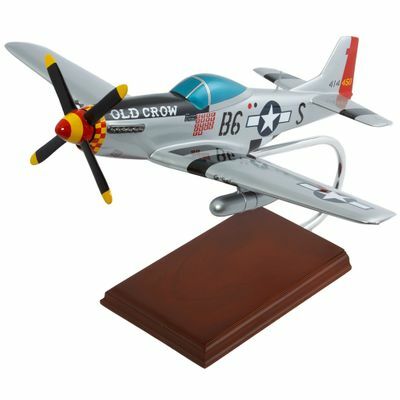 Model Airplanes – This P-51 Mustang Model Airplane is a scale model of the original North American P-51D Mustang “Old Crow” piloted by Bud Anderson. The P-51D Mustang Model Airplane is crafted from wood and is an impressive aviation gift. Our P-51D Mustang model aircraft arrives fully assembled and includes a display stand. In 1944, Captain Clarence “Bud” Anderson returned to the 375th Fighter Group for a second combat tour. He was assigned a new P-51D Old Crow in the dark green mask. Captain Bud was on a mission when the first drop of snow in Germany fell. Thus he noted a mixed flight of dark green and silver aluminum Mustangs below him. After his mission, he told his ground crew that the one painted the dark green stood out against the snow background and silver ones appeared to the have the best camouflage. Because of that Bud suggested to paint the Old Crow a silver color. This authentic, extraordinary replica of the original aircraft has been faithfully reproduced with kiln dried Philippine mahogany wood. 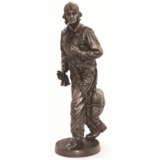 Each model is meticulously carved, hand sanded and painted following exact blueprint details of the original aircraft. The result is a handsome, wood airplane sculpture to be admired and enjoyed.